Two men wakes up in a cell with their feet chained to the ground. To escape, they must prove they will to survive. 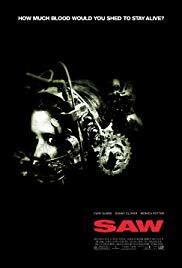 Saw made such a big buzz and started such a long series of similar films (7 in less than 10 years) that it is hard to remember it for what it truly is: a totally innovative concept, at least at that time (there still are no other movies quite like this one). I am not a huge fan of the rest of the series, which I found quite repetitive, but one must confess that this first Saw was brilliant. The story is complex and cleverly-told. The film starts as the characters wakes up in their traps and you get to discover what’s happening, the various clues, the message, in the same time as the films characters. This quickly captivates the audience and builds a very dense suspense. The mystery is thick, the psychological tension at his maximum and the end absolutely bluffing. I absolutely did not expect it and was stunned…I actually remember watching it again the day after to make sure I understood everything. For the few remaining human beings that haven’t seen that film…go ahead, you will like it (unless it disgusts you, hehe). Let’s remember that it is also the film that started the career of the young genius of horror James Wan (Insidious, The Conjuring, Dead Silence).